Shikhar Dhawan's childhood coach Tarak Sinha tells Rediff.com's Manu Shankar his ward's good form and consistent performances at the domestic level helped him score a ton on debut in Mohali on Saturday. It is normal to expect the coach of a debutant cricketer stay glued to the television as his ward does battle on the field. But Shikhar Dhawan's coach Tarak Sinha was doing nothing of that sort. While Dhawan was smashing the Aussie bowlers to all corners of the park on Day 3 of the Mohali Test he Sinha was busy coaching his batch of future cricket stars. "I was confident that Shikhar (Dhawan) would do well at the highest level. He has been a consistent performer in the domestic circuit and his form has been good leading up to the Test match. "He's reaping benefits of a consistent showing in the domestic circuit," he added. The debutant bludgeoned his way to 185 off 168 balls as the hosts finished the day in a commanding position. The southpaw surpassed West Indian Dwayne Smith's 93-ball ton on debut, in the third Test against South Africa in Cape Town in January 2004. "Shikhar is a confident and fearless batsman. He has had to wait for his chances, as there were many seniors ahead of him. Now it's important for him to make it count," Sinha added. 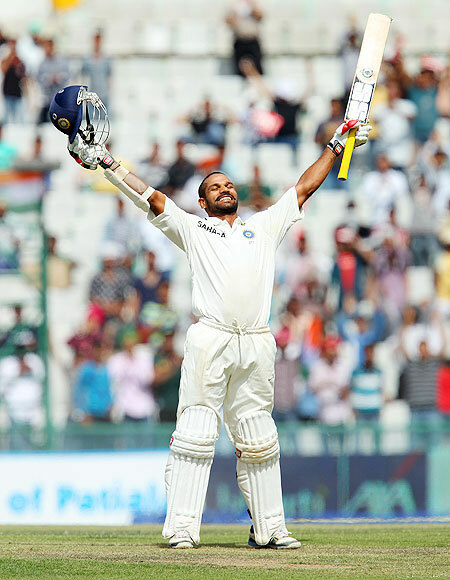 Dhawan had to work to make his way to the top, and this is a breakthrough season for him. He is one of the most prolific scorers -- 833 runs in the current domestic season, add to that 309 runs in Duleep Trophy (from just two matches) -- and it's kept him in good form ahead of the Australia Test series. Many will remember his masterful innings of 116, when he led Delhi to victory, chasing 270 against Maharashtra, in a Group B Ranji Trophy match in December. When quizzed about what stands out about his game, Sinha said, "He plays carefree cricket. He never looked nervous at any point (during his innings on Friday), and even if you saw the single that he took to reach his ton, it showed that he would make it to the other end," said the coach. "Since India is looking for fresh faces, Shikhar can comfortably fill in the role of opener," he added. So what are his chances of making a double ton? "Well, I hope that he scores a double, because so far he has played flawless cricket. It has been a chanceless innings. He just needs to be patient in the initial first half and then he can definitely reach the landmark," said Sinha.